If your question about our fire pits, custom spheres and accessories are not answered on our FAQ or frequently asked questions page, please feel free to contact us or give us a call: (888)409-0020. Do your fire pits burn wood? Yes. Our fire pits are wood burning fire pits but most can be converted to gas. Do your fire pits burn gas? Yes. Our fire pits can be purchased with the Liquid Propane Gas (LPG) or Natural Gas (NG) kits (installation not included). See some photos of the gas fire pits burning. If you have already purchased your fire pit they can also be converted to either propane gas or natural gas by purchasing a gas kit. If you would like to view or download the manuals for the gas kits we sell please select from the options below. I am installing an underground natural gas line. How high should the line come up out of the ground? How tall are the spheres? 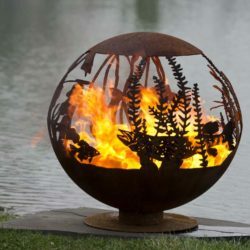 The fire pit spheres range from 37.5 inches to 43 inches high. The spheres with flat steel bases are 40″ high. Fire Pits with the craggy tree branch bases are 43 inches high. Here is a photo from a customer that shows how tall the Up North fire pit is when standing next to it. How much wood will your sphere fire pits hold? Our sphere fire pits will hold about a wheelbarrow full of wood. How do you get the logs in your sphere fire pits? We create the openings large enough to easily fit an unsplit log 12 inches in diameter. The largest opening in the Up North fire pit is 24 inches wide. The diameter of the spheres and deep fire bowls is 37 inches in diameter. Are your fire pits made in the USA? Yes. Our fire pits are handcrafted in the USA with American-made steel. Can I buy your fire pits locally? We have several locations in the USA where you can buy locally. Please see our “Where to Buy” page for locations. We also have a dealers in Australia, Norway & France. Their information is also on the “Where to Buy” page. France has exclusive rights to multiple other countries in the EU as well. Please see our “Where to Buy” page for details. What is the footprint of the fire pits? The footprint of the Sand Dune fire pit is 24 inches. The footprint of the fire pits with flat steel bases is 18 inches. The footprint of the Mini Dune is 8-3/4 inches. The footprint of Emergence (Dragon) fire pit is 8-3/4 inches. The footprint of Earth & Sky is 32-3/4 inches. Which gas kit do I need for my fire pit? 1. If you want to buy the gas kit separately you would first need to choose your gas type. 2. Then choose your ignition system. 3. Some of our fire pits do not need a burner pan giving you yet another option. In the description of the gas kits it will tell you which fire pits are recommended for that particular kit. When purchasing your fire pit just choose from the dropdown lists the options mentioned above and the correct gas kit for that fire pit will populate along with the price change with your selection. Do you sell the gas kits? Yes. We sell HPC gas kits but use our own custom burner pan. We can sell the kit with the fire pit when you purchase (recommended) or if you have already purchased a fire pit and you would like to convert it to gas, the kits are available for sale on our website. What is the warranty on the gas kits? We sell Hearth Products Control (HPC) gas kits to work with our fire pits. The warranty on the Stainless Steel Components * is 3 years for residential and 1 year for commercial use. Will your fire pits stain my deck or patio? Your fire bowl has been treated to produce a rust patina finish. This process will continue as your fire pit sits outdoors in the elements, and the finish will harden off after about a month. Until the finish is completed, you may prefer to protect the surface under your fire pit, as it may stain. If your deck or patio gets stained, CLR or a similar product should remove the stain. Will your fire pit burn my wooden deck? We do not recommend putting your wood burning fire pit on a wooden surface. It probably would not catch fire but may create marks on your deck. To be safe, if you choose to put it on a deck, is to put a heat shield such as decorative stones or pavers under your fire pit. Always check your local fire ordinances as to what is allowed in your area. Do you post fire regulations for my area? We provide a link to Ohio fire regulations, but no other states at this time. However, we will be glad to post any others that are provided to us. What kind of maintenance will your fire pit require? How do I clean out the ash? It is recommended to empty the ashes periodically because the ashes can be corrosive to the fire pit when wet. It will also help keep the drain hole open. We recommend using a rounded scoop shovel to clean out the ash. Some people cut the handles shorter for ease of use. Email cancellations must contain the following: First name, last name, order number, and email address. Please provide contact information so that we may contact you if we have questions in regards to canceling your order. Please send cancellation requests to orders@thefirepitgallery.com. If you wish to cancel a commissioned piece order please see “What is your return policy on custom work?” below. Every effort will be made to accommodate the cancellation of your order, providing your order has not been shipped out. In the event that a cancellation was submitted (via email or phone), and your order was shipped out after, we will gladly refund the complete balance charged including shipping. However, if the cancellation was documented as received after the order was shipped, we will refund the merchandise total less shipping. What are your return and damage policies? Please request a return by emailing contact@thefirepitgallery.com. Because refunds will not be issued in full for items damaged in return shipping or returns that are never received, we highly recommend that you insure all return shipments and provide The Fire Pit Gallery with the shipment tracking number. Unless damaged in shipment all international sales are final. The cost of return shipping is always higher than the cost of the fire pit itself. If you receive a damaged item, The Fire Pit Gallery will assist you in receiving a replacement or refund as quickly as possible – at no cost to you. In the unlikely event that you find your product to be damaged upon opening it please notify us at contact@thefirepitgallery.com. Please notify The Fire Pit Gallery of any damages on the product or packaging within 5 days of receipt. Do you create custom designs or commissioned pieces? Yes. We would love to partner with you to make your design idea a reality. Our custom designs start at $200 over the price of a bowl on the website and could go up from there depending on the design. For example, a sphere on the website sells for $1,850.00 so a custom design would start at $2,050. We will give you an exact quote when the design has been agreed upon by both parties. We require a $100 nonrefundable deposit for custom designs. We also require full payment, with the deposit being applied to the purchase price, to place your order. Allow anywhere from 3 weeks to 6 months lead time before your order ships. For the current lead time please refer to the banner at the top of our website. For your convenience, click this link to make a deposit. Select “Custom Designs – Commissioned” for when you are ready to get started. What is your return policy on custom work? Refunds are available only if no materials have been purchased and no work has begun. Once materials have been purchased or work on the piece has begun, all sales are final. Lead Time: Varies – 2 weeks to 6 months. – Please check the banner at the top of our site for current lead times. Most fire pit are hand drawn by Melissa and then hand cut with a plasma torch. Because these are all unique works of art they cannot be rushed. We are proud of every fire pit that goes out of door and we need to allow time to make sure your fire pit is perfect. In addition to the lead time, please allow for the actual shipping time, which can vary from 1-15 business days for the continental USA depending on where it is being delivered and longer for most international shipping. Yes, we offer free shipping for our fire pits, accessories and books anywhere in the continental United States. If you wish to ship any of those items to Alaska or Hawaii, please contact us for a shipping quote. Shipping will be charged on the Antler Mount Kits and the Art Prints. The shipping cost will be calculated during the checkout process. Yes, we can ship to Alaska and Hawaii, but free shipping on fire pits only includes the continental United States. If you wish to ship to Alaska or Hawaii, please contact us for a shipping quote. Do you ship internationally using air freight? Yes. We can offer the option of international shipping using air freight. It does take several days to get the quote back from our freight forwarding company and the rates typically are significantly higher than ocean freight. Do you ship internationally using ocean freight? Yes, we can ship using ocean freight to most countries. Free shipping only includes the 48 contiguous United States. See below for the list of countries we have set up in our store. If you wish to ship to another country not included in our list below, please contact us for a shipping quote. Ocean freight is much less expensive than air freight. We ship to your nearest sea port. The shipping rate includes sea freight to the nearest port/terminal, insurance and the ISPM-15 Certified Wood Crate required, but will not include customs broker fees, import taxes, tariffs, or any fees incurred at the destination port. If you have a customs broker, they can get those numbers for you. Please be aware that this ships to a port and does not include freight shipment inland to your location. Customs clearance and shipment to the final destination can be arranged by the contact person at your destination port but is not included in our shipping cost. Right now, we have the following countries set up on our website, but soon hope to have more added. To find the rate to ship to your country, please begin the checkout process. When you have entered your country and province or state the shipping amount should show up. Please read all of the relevant information before you submit your order. If you choose not to order at that time simply empty your shopping cart or exit the checkout process. Thank you. *** PLEASE NOTE*** If ordering with an international credit card our processing company uses the postal code for validation so it needs 5 digits in that field. Please use leading zero’s if necessary. What is CA Prop 65 Warning?